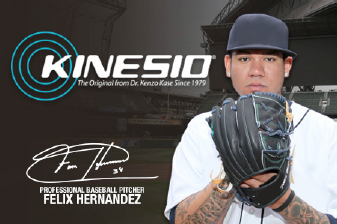 Kinesio Holding Corporation is proud to announce that Seattle Mariners’ pitcher, Felix Hernandez, is the first North American professional athlete to be an official endorser of Kinesio® Tape in the company’s long history. Hernandez will be the new face of Kinesio Tex Classic and Kinesio Pre-Cuts. Kinesio is a trusted, must-have brand for retailers looking for growth from a new and innovative product category and the endorsement from “King Felix” will assist in this endeavor. Felix Hernandez made his Major League debut in 2005 and has been on the mound for the Mariners ever since. With five all-star appearances, Felix pitched the 23rd Perfect Game in Major League history against the Tampa Bay Rays on August 15, 2012. Most recently on May 10, 2015, Felix recorded his 2,000th strike-out and became the fourth youngest pitcher ever to complete this feat. About Kinesio Holding Corporation: For more than 35 years, Kinesio has been breaking ground in the fields of sports performance and physical therapy. The Kinesio Taping® Method is designed to facilitate the body’s natural healing process while allowing support and stability to muscles and joints without restricting the body’s range of motion. Kinesio is the trusted tape of choice for the world’s elite athletes and the brand is firmly established as the global leader in therapeutic taping.